Edraw Max is 100% compatible with Edraw Mind Map. Edraw Max is an all-in-one graphics software that makes it simple to create more professional-looking diagrams. It provides more examples and drawing types. 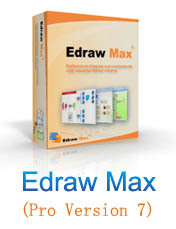 Edraw Max Standard Version Price: $99 USD. Lifetime License: $148 USD One time fee. No subscriptions. No monthly fees. Edraw Max includes all functions of Edraw Mind Map. But Edraw Max can draw more diagrams such as flowchart, org chart, network diagram and business form. Edraw Max can open the files created by Edraw Mind Map. Edraw Mind Map Free Version is being distributed as Freeware for personal, commercial use or educational purpose. It may be included with CD-ROM/DVD-ROM distributions. You are NOT allowed to make a charge for distributing this Software (either for profit or merely to recover your media and distribution costs) whether as a stand-alone product, or as part of a compilation or anthology, nor to use it for supporting your business or customers. It may be distributed freely on any website or through any other distribution mechanism, as long as no part of it is changed in any way. Edraw Max Professional Version, another all-in-one diagram software, is available in a corporate, military or government installation for commercial use. What's New in Edraw MindMaster 6.5?